BACKGROUND AND PURPOSE: Intraoperative MR imaging is increasingly being used to control the extent of surgical resection; however, surgical manipulation itself causes intracranial contrast enhancement, which is a source of error. Our purpose was to investigate the potential of monocrystalline iron oxide nanoparticles (MIONs) to solve this problem in an animal model. METHODS: In male Wistar rats, surgical lesions of the brain were produced. The animals underwent MR examination immediately afterward. In the first group, a paramagnetic contrast agent was administered, whereas the second group of animals received MIONs 1 day before surgery. In a third group of animals, malignant glioma cells were stereotactically implanted in the caudoputamen. Two weeks later, MIONs were IV injected and the tumor was (partially) resected. Immediately after resection, MR examination was performed to determine the extent of residual tumor. RESULTS: Surgically induced intracranial contrast enhancement was seen in all animals in which a paramagnetic contrast agent was used. Conversely, when MIONs had been injected, no signal changes that could be confused with residual tumor were detected. In the animals that had undergone (partial) resection of experimental gliomas, MR assessment of residual tumor was possible without any interfering surgically induced phenomena. CONCLUSION: Because MIONs are stored in malignant brain tumor cells longer than they circulate in the blood, their use offers a promising strategy to avoid surgically induced intracranial contrast enhancement, which is known to be a potential source of error in intraoperative MR imaging. MR imaging is increasingly being used as an intraoperative imaging technique. In the recent past, different concepts for the intraoperative use of MR imaging have been developed (1–3). One of the main indications for intraoperative MR imaging is the intraoperative assessment of the radicality of surgical resection of brain tumors (4, 5). The effectiveness of intraoperative MR imaging in improving surgical results in patients with high-grade gliomas has recently been shown (6); however, surgical manipulation opens vessels and can cause blood brain–barrier disruption, which in turn causes surgically induced intracranial contrast enhancement (5, 7). This was seen on the images of all patients for whom intraoperative MR imaging was performed and resulted in a considerable percentage of uncertain findings (7). The dilemma is that the administration of a paramagnetic contrast agent is necessary to detect residual enhancing tumor but also causes surgically induced enhancement of tissues that do not represent tumor. The aim of this study was to test whether monocrystalline iron oxide nanoparticles (MIONs) can solve this dilemma in a rat model. MIONs are taken up by endocytosis by malignant glioma cells and lead to a long-lasting signal increase of the tumor in T1-weighted sequences in animal models (8, 9). The basic idea of our study was that there is a window in which the MIONs are already almost completely eliminated from the blood by the reticuloendothelial system but are still stored in the brain tumor cells. This window might be used for intraoperative MR imaging to avoid the diagnostic problems that arise with surgically induced intracranial enhancement. Animal experiments were performed in accordance with the national animal protection laws. A total of 36 Wistar rats were divided into three groups. Group 1 consisted of 16 animals with different types of brain lesions. The contrast agent used was paramagnetic. In each animal, a small craniotomy was performed. In eight of the rats, a lesion of the cortex was induced by superficial electrocoagulation, whereas in the other eight rats, the cortex and underlying white matter were ablated by means of a sharp spoon. The aim was to produce brain lesions with and without opening vessels. Thirty minutes after inducing the different types of brain lesions, the animals were examined with a high-field MR imager (1.5 T). The imaging protocol consisted of T1-weighted sequences obtained before and serially (5, 10, and 15 min) after the IV administration of a single dose (0.1 mmol/kg) of a paramagnetic contrast agent (Magnevist; Schering AG, Berlin, Germany). Group 2 consisted of 10 animals with different types of brain lesions. MIONs were used as contrast agent. Each animal received an IV dose of 10 mg of MIONs per kilogram of body weight. Sixteen hours later, a preoperative (T1-weighted) MR examination was performed. A small craniotomy was performed in each animal. In five of the rats, superficial electrocoagulation of the cortex was performed, whereas in the other five rats, the cortex and underlying white matter were ablated by means of a sharp spoon. Thirty minutes after the different types of brain lesions were induced, the animals were examined with a high-field MR imager (1.5 T). T1-weighted sequences were acquired. Group 3 consisted of 10 animals comprising a C6-glioma model. The animals underwent surgical resection, and MIONs were used as contrast agent. In each of 10 animals, 5 μL of a suspension containing 5 × 105 C6-glioma cells were stereotactically implanted in the caudoputamen. Fourteen days later, each animal received an IV dose of 10 mg of MIONs per kilogram of body weight. Sixteen hours later, a preoperative (T1-weighted) MR examination was performed. Two animals had not developed brain tumor and were excluded from further study. Craniotomy and tumor resection (in most cases, partial resection) were performed in the remaining animals. Thirty minutes after the end of the operation, all animals underwent repeat MR examination. In one animal in which gross total tumor removal had been achieved, MR imaging was repeated again after the IV administration of a paramagnetic contrast agent. All MR examinations were performed using a high-field MR imager (1.5 T). T1-weighted spin-echo sequences were acquired. The imaging parameters were 20/500/4 (TR/TE/excitations); section thickness, 2 mm; field of view, 65 mm; matrix, 256 × 256; and acquisition time, 4 min 16 s.
The MIONs used (DDM 43-34-104, Schering) consisted of a crystalline iron oxide core (6.6 nm in diameter) and a carboxydextran covering. The hydrodynamic diameter of the particles was 20 to 40 nm (information supplied by manufacturer). After the last MR imaging session, the animals were killed while still under anesthesia and the brains were embedded in paraffin. Serial, 1-μm-thick sections from the area of the maximal tumor and surgical lesion extension were prepared. All sections were stained with hematoxylin and eosin. In group 1 (different kinds of surgical brain lesions and a paramagnetic contrast agent), meningeal enhancement was seen in all animals regardless of the type of lesion inflicted on the brain. Intraparenchymal enhancement was also seen in all animals. A sharp distinction between the different types of surgical brain lesions could not be made by MR imaging, although after abrasive (vessel-opening) brain lesions, the enhancement tended to be more time dependent (ie, the enhancement was more pronounced the more time had elapsed between injection of the paramagnetic contrast agent and acquisition of the T1-weighted sequence). After electrocoagulation of the brain (non-vessel-opening lesion) the surgically induced enhancement was “solid” appearing and constant during the observed period (Fig 1). Surgically induced intracranial contrast enhancement. Thirty minutes after a superficial cortical electrocoagulation has been performed, T1-weighted images (500/20/4) obtained after the IV administration of a paramagnetic contrast agent show intense enhancement at the edge of the electrocoagulation. The differentiation of this surgically induced intracranial contrast enhancement from tumor enhancement can be difficult. A, Obtained 5 min after the IV administration of a paramagnetic contrast agent. B, Obtained 15 min after the IV administration of a paramagnetic contrast agent. In group 2 (different kinds of surgical brain lesions and MIONs as contrast agent), none of the animals had preoperative intracranial hyperintensities revealed by MR imaging. This indicated that the normal rat brain does not store MIONs in an amount detectable by MR imaging (Fig 2). After electrocoagulation or after abrasive lesion of the brain, MR imaging was repeated and, again, did not show intraparenchymal hyperintensities (Fig 2). In summary, MIONs did not cause hyperintensities of the normal (preoperative) rat brain nor did they lead to intraparenchymal hyperintensities after brain lesions had been inflicted on the rat brain. A, Sixteen hours after the IV administration of MIONs, T1-weighted images (500/20/4) do not show intraparenchymal hyperintensities. B, Superficial cortical electrocoagulation was performed. Thirty minutes later, the T1-weighted images (500/20/4) do not show any intraparenchymal hyperintensities that could be confused with residual tumor. Note the hypointensity representing the electrocoagulation (arrowhead). 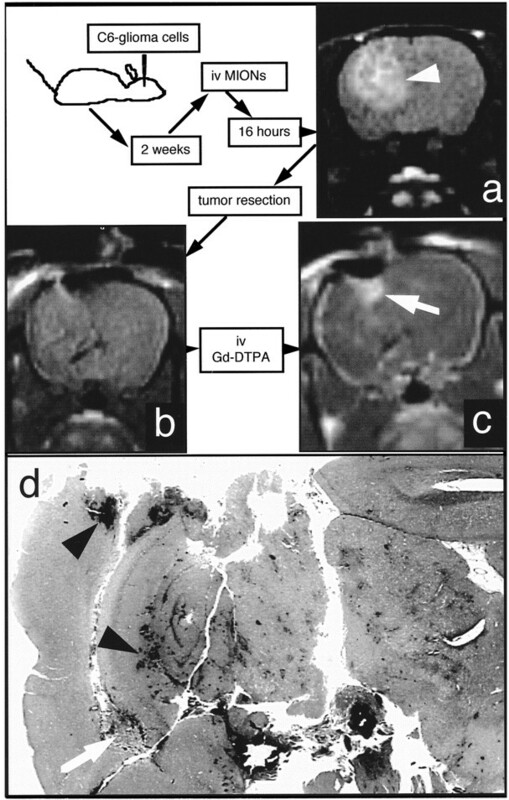 In group 3 (brain tumors and [partial] surgical resection and MIONs as contrast agent), the tumors were depicted as hyperintense areas on the preoperative T1-weighted images (Fig 3). The average contrast between tumor and normal brain tissue (contralateral hemisphere) was 1.32 (SD, 0.11). During surgical resection, two animals died and no further MR examination was conducted. In five of the remaining six animals, residual tumor was seen as persisting hyperintensity but no new hyperintensities to indicate surgically induced phenomena were noted (Fig 3). In one animal, a complete removal of all hyperintense tumor was achieved; the postoperative MR examination did not reveal any hyperintense regions. To compare these findings with those after the administration of a paramagnetic contrast agent, gadolinium-DTPA (0.1 mmol/kg) was IV injected and the MR examination repeated. Intense contrast enhancement that would have prevented the distinction between residual tumor and surgically induced contrast enhancement was observed (Fig 4). A, Two weeks after the stereotactic implantation of C6-glioma cells and 16 hours after the IV administration of MIONs, a preoperative T1-weighted image (500/20/4) shows the huge right-hemispheric tumor hyperintense to brain. B, Partial resection of the tumor was performed, which is mirrored by better depiction of the third ventricle (arrowhead). There is still massive residual tumor. Important: note the absence of interfering surgically induced changes (compare fig 1 and fig 4). In the animals in which C6-gliomas were (partially) resected, MIONs made it possible to determine the presence or absence of residual tumor, whereas the IV injection of a paramagnetic contrast agent produced confusing findings. A, Two weeks after the stereotactic implantation of C6-glioma cells and 16 hours after the IV administration of MIONs, a preoperative T1-weighted image shows a right-hemispheric tumor hyperintense to brain. B, Tumor was almost completely resected and postoperative MR image, obtained 30 min after the end of the operation, does not show hyperintense residual tumor. Because of brain shift, the resection cavity is almost completely filled with brain tissue. Also note the absence of surgically induced phenomena. C, T1-weighted imaging was repeated after the IV administration of a paramagnetic contrast agent and shows intense surgically induced contrast enhancement (arrow), indistinguishable from residual enhancing tumor. D, Histologic section shows multiple intraparenchymal bleeds due to surgery (arrowheads) but no residual tumor, except a small intraventricular tumor nodule (white arrow) that was too small for MR imaging detection. Intraoperative MR imaging is a rapidly growing field. Presently, one of the main indications for intraoperative MR imaging is to control the extent of resection in patients with brain tumors. However, in patients with contrast-enhancing brain tumors, a paramagnetic contrast medium has to be IV injected to detect residual tumor. Our animal experiments, as well as other studies (5, 7), have shown that surgical trauma of the brain causes immediate (non-tumorous) contrast enhancement. The probable mechanism is surgical opening of blood vessels, with subsequent leakage of contrast medium, and surgical damage (eg, electrocoagulation) to the blood-brain barrier. Surgically induced intracranial contrast enhancement is a potential source of error in intraoperative MR examinations and leads to nondiagnostic intraoperative images in approximately 10% of patients (5, 7). The main problem with paramagnetic contrast medium in intraoperative MR imaging is that it is administered after the surgical damage to the brain. The contrast medium leaks out of surgically opened blood vessels and penetrates the surgically damaged blood-brain barrier. The ideal contrast agent would be one that is administered before the operation starts, causes long-lasting tumor enhancement, and is quickly eliminated from the blood, so as to prevent leakage of the contrast medium out of surgically opened vessels and passage of the surgically damaged blood-brain barrier. MIONs might offer a solution to the problem of surgically induced intracranial contrast enhancement. They are taken up by tumor cells by endocytosis (10) and are eliminated from the blood relatively quickly by uptake into the reticuloendothelial system (11). After administration of MIONs, malignant gliomas appear hyperintense on T1-weighted sequences in animal models (8, 9). This phenomenon lasts longer than 24 hours (9) (ie, the tumor is still hyperintense on T1-weighted images, when almost all MIONs have been eliminated from the blood by the reticuloendothelial system (11). This represents the window that might be used for intraoperative MRimaging, because it might offer a means of detecting residual tumor without superimposed confusing surgically induced intracranial contrast, which is inherent to the use of paramagnetic contrast agents inintraoperative MR imaging (5, 7). After surgical trauma to the brains of normal rats, we always observed intraparenchymal enhancement after the IV injection of a paramagnetic contrast agent but we never saw hyperintensities after identical surgical brain lesions after the administration of MIONs. Moreover, in the animals in which C6-gliomas were (partially) resected, MIONs made it possible to determine the presence or absence of residual tumor, whereas the IV injection of a paramagnetic contrast agent produced confusing findings (Fig 4). Thus, MIONs are a promising concept to avoid surgically induced intracranial enhancement in intraoperative MR examinations of patients with high-grade gliomas. However, at present, many aspects of this new approach are unclear or unresolved. First, it is unclear for which intracranial tumor entities this approach is applicable. To date, all groups have studied MION uptake in malignant glioma models only (8, 9). The C6-glioma cells grown in Wistar rats show homology with human malignant glioma with neovascularity, parenchymal invasion, and necrosis (12). It is not known whether less malignant brain tumors also take up MIONs. Second, little is known regarding the optimal dosage of MIONs. Third, the optimal delay between injection of the nanoparticles and the intraoperative MR examination has not yet been fully elucidated. The use of MIONs is a promising strategy to avoid surgically induced intracranial contrast enhancement, which is known to be a potential source of error in intraoperative MR imaging of patients. At present, it is unclear for which contrast-enhancing intracranial tumor entities this approach is applicable and which MION dosage and delay between injection of MIONs and intraoperative MR imaging are optimal. ↵1 Address reprint requests to Michael Knauth, MD, Department of Neuroradiology, University of Heidelberg Medical School, Im Neuenheimer Feld 400, D 69120 Heidelberg, Germany.